I associate John Denver with road trips: rolled down windows, long ribbons of asphalt, and a carful of untrained singers happily caroling "Take me home, country roads." I think of his singing as characterized by a simplicity redeeming a sentimentality that might otherwise seem oppressively earnest. The project of having opera singers interpret these open-air ballads was one I viewed with intense if somewhat skeptical curiosity. The undertaking was the brainchild of Denver's arrangers, and facilitated by the considerable influence of Placido Domingo (more details here.) I couldn't resist the opportunity to review the resulting album, especially since I'm currently staying with my mother, whose adolescence coincided with Denver's heyday, and who therefore led Denver sing-alongs on road trips. Her enthusiasm for the project was great; and so I undertook my critical listening with her helpfully at hand as a one-woman control group for my bias towards loved singers and potential indifference to Denver's lyrics. The album's attempt to find a meeting ground for Denver's music and operatic voices met with decidedly mixed results. Too many of the arrangements were dominated by sentimental strings wallowing in the predictable harmonies common to many classical crossover or pseudo-classical albums. I thought that allowing the participating artists to cross further over into Denver's musical language--or, indeed, simply a greater variety in the arrangements--would have been, on the whole, more felicitous. On the whole, I'm inclined to regard the disc more as a curious conversation piece than anything else, but my mother enjoyed listening to it enormously (including the heckling of misfires), leading me to the conclusion that it may be more successful with John Denver fans than diehard opera lovers, for situations where those two categories don't overlap. Owen Wingrave may suffer by comparison with Britten's other operas, but it's still, to my mind, a stimulating piece, with exciting vocal writing, some specially beautiful music for its baritone hero, and a drama both moody and poignant. The novella by Henry James is largely expository in its treatment of a warlike family's conflict with last scion, as he turns his back on battlefields. James speaks of their old house as imbued with a "sense of bereavement and mourning and memory, of names never mentioned of the far-away plaint of widows and the echoes of battles and bad news. It was all military indeed, and Mr Coyle was made to shudder a little at the profession of which he helped to open the door to harmless young men." Wingrave is "almost cursed" with a sense of proportion more accurate than his family's. 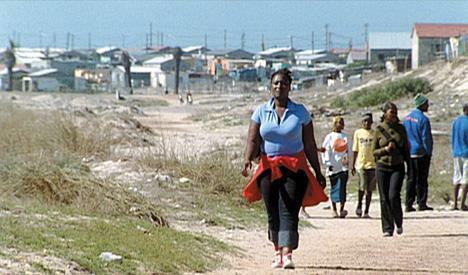 The vibrant, award-winning film U-Carmen eKhayelitsha was released in 2005, but it was a recent and welcome discovery to me (through Netflix's streaming services, of all things.) Directed by Mark Dornford-May, the film is adapted (or, better, transladapted) from Bizet's Carmen, reconfiguring the drama and the music to provide, as Bizet did, a gripping tale that balances between exoticism and realism, mixing gritty quotidian detail with gestures of startling romanticism. The fateful events play out in a suburb of Cape Town, where Carmen enjoys solidarity with the community of cigarette-rollers and marketplace traders, where she can easily disappear in dirt lanes between tin-sided houses to escape the pursuit of the urban police. The setting of urban and suburban South Africa in the late twentieth century is given far more specificity than Bizet's Seville was. Although occasionally self-conscious and semi-guilty about my fascination with the camera's dwelling on unfamiliar landscapes--long stretches of highway through near-desert, bright fabrics on laundry lines--I enjoyed frankly the sensitive delineation of social and religious dynamics in the community where the narrative unfolds.